Sra Bua by Kiin Kiin sees itself as a traditional Thai restaurant with a modern twist, but it’s not. The sister restaurant to Copenhagen’s still-Michelin-starred Kiin Kiin, Sra Bua offers nothing that could ever qualify as “traditional”, from its curry ice creams to fizzy pop-rock-laced gelatos, its dizzyingly formal parade of odd tiny bits to its extremely strict reservation policy (don’t even think of bringing an extra body to dinner at the last minute, folks — the usual mai pen rai will undoubtedly come from you, not them). There is spherified lobster essence and foam masquerading as coconut sauce. There are globules and powders and custards galore to entertain any reasonable diner. But this vision of “molecular Thai” is not traditional, and not really Thai food. In case you are wondering, yes, this is indeed going to be a great big grump-fest about krazy kids and their krazy food, and why the neighbors are so loud with their terrible music and why the numbers are too small on my cordless talking-thingy. And yes, I hated Sra Bua. So that is out of the way. To be fair, the menu has recently changed. It may be awesome now. But the meal I had was a procession of dishes with nods to Ferran Adria and Rene Redzepi tossed in but which all basically tasted the same — creamy and sweet — with some grumbling undertones of spice and salt and maybe some fishiness and smoke somewhere in there, possibly, like a stain that’s been furiously scrubbed and everything hastily ironed out again to look shiny and happy. It was shiny happy food, without the bits of drama like the lurking bitter pop of a baby eggplant, or stink of smelly fish paste. It was Thai food on Prozac. This got me thinking. After helping Chef McDang with his first English-language cookbook, “The Principles of Thai Cookery”, I have been lucky enough to get to work with him on his second, to be called, tentatively, “Modern Thai Cookery”. The recipes — Thai-marinated pork wiener schnitzel, or green curry osso bucco — are straight-up fusion, Thai ingredients melded with Western cooking techniques. But the flavor profiles remain staunchly, resolutely Thai. What is Thai? According to Chef McDang, it’s fish sauce. Palm or coconut sugar. A natural acid, like lime or water olive or tamarind. A paste base. An unscented oil. It’s simple, and allows for flexibility, because neither of us is an authenticity troll (an entirely different, equally problematic can of Sriracha-drenched worms). This then got me thinking about rebels. The English “aesthetic movement” of the late 1800s stripped away boundaries between the arts and angered establishment figures. Impressionism inspired derision amid people who didn’t get the strokes and colors; the term itself was meant to be an insult. And there was punk, which many many people hated, and then hated again after it was defanged and sanitized. In the book “Retromania” by Simon Reynolds (thanks @sjmontlake! ), critic Julie Burchill wrote of punk’s inevitable demise: “I’m just a cranky old punk past its prime. But the alternative is hideous, and it is the only alternative. It is to believe in ROCK’S RICH TAPESTRY.” (ppg. 6-7. I haven’t gotten very far). Maybe Sra Bua is part of “Thai food’s rich tapestry”, with its winks and grins and gastro-references. And I could just be a grumpy old person, like those guys who hated Monet, crawling out of my cave every once in a while to scarf down a bowl of noodles and bellow at the occasional squirrel. I do believe that, with the explosion of restaurants worldwide, diners are now demanding new tricks and gimmickry, ever-more gimcracks and bonobos. They want to be entertained. And if it tastes good, well, that’s great too. But this is the opposite of what I want. I guess this means I am old-fashioned. I just want the food. @ Anney… it sounds like you went to Bo.lan shortly after it opened, when it was probably still having ‘birthing’ pains, in which case it deserves a re-visit. Although I haven’t been yet – for no particular reason – from what I’ve heard, its dishes have finesse. We tried Bo-lan a few years ago and were disappointed. The starter tasting plate was good, but the main that was supposed to be a whole fish was just a few scraps of mainly bone – and there was no great finesse about it. We let the hostess know that we were not happy and Dylan came out from the kitchen and thanked us for complimenting his food! That was definitely not what we were doing. We will never go back. Ah! Some serious waitstaff language issues! How embarrassing. For what it’s worth, I always enjoy Bo.lan — more, actually, than nahm. I think it is because I really hate eating in hotels. The emphasis on “fine dining” (ie. justifying the usually sky-high prices needed to run a hotel restaurant) is just so oppressive. So while Bo.lan’s prices are just as sky-high, it has a more casual vibe. That said, I can see how you can be disappointed. The Western-style plating seems like it runs against the grain of one important thing that Thai food stands for: a sense of belonging and community. Haha, you sound like David Thompson! That said, you should check out Sra Bua if you can (although nahm is a better bet). The menu has since changed and you could be surprised! 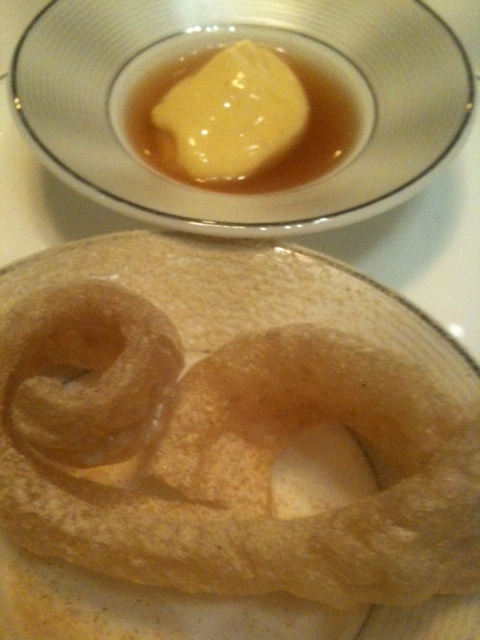 We enjoyed Gaggan very much on our last visit to Bangkok, and have recommended it to friends. The degustation was fun, especially the yoghurt eggs…… I couldn’t eat a raw egg that way, but I loved this one – although the chap at the next table couldn’t stomach it and it was rapidly ejected! Haha! That is still one of my favorite parts of the degustation. There is no bellowing without shaking a fist! I agree with you. I was disappointed with my meal there too, because nothing ‘popped’ – either in taste, technique or presentation – which was the point to go eat there. I have more respect for Nahm, where the expat Chef focuses on authentic recipes & uses top-grade ingredients. It happens to be in a hotel. I enjoy Gaggan – an independent restaurant – with its progressive (not molecular) Indian cuisine. Here, the food pops for me on taste, technique & presentation without being gimmicky. I agree — paradoxically, Nahm (the traditional restaurant) feels more exciting than the molecular one! I, too, enjoy Gaggan, although I don’t understand his inclusion of Italian dishes on his tasting menu. In fact, I’m going tonight! That explains a little. Isn’t a hotel restaurant a different breed–either flashy food or some form of comfort food? True. In Bangkok, they are traditionally the only place to get a “good” meal — the arbiters of fine dining. As the scene here progresses, that is becoming less of a case, hence the need to hotels to lure people back with some kind of gimmickry. Love your review, dear Glutton – for us ‘out of towners’ – where is this gastro temple please?? Oh! It’s in the Kempinski Hotel.